The Q-and-A with Aimee Miller-Ott: Are cellphones disconnecting us? According to the Pew Research Center, 95 percent of Americans own a mobile phone. Many of us walk around as if our smartphone were an appendage. From the moment we wake up to the time we slink back into bed, our phones are with us. 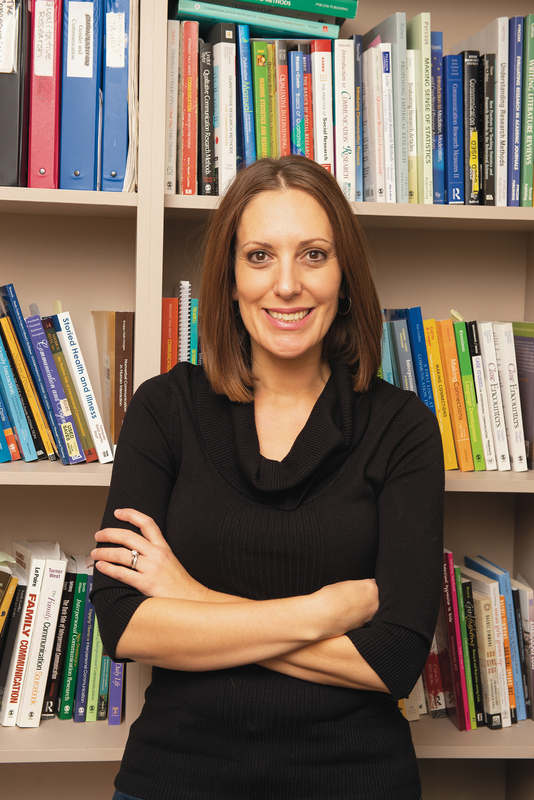 For the last decade, School of Communication Associate Professor Aimee Miller-Ott has studied how our ever-increasing use of mobile phones has affected our interpersonal relationships, may they be between romantic partners, friends, or parents and their children. Miller-Ott began researching the devices partly due to how she saw them interfering with her life. Miller-Ott and her collaborators, University of Hartford Professors Lynne Kelly and Robert Duran, have published their research in several academic journals and books, including Communication Studies, Emerging Adulthood, Encyclopedia of Mobile Phone Behavior, Southern Communication Journal, and Western Journal of Communication. Last April, Miller-Ott presented “So Close, Yet so Far: Staying Connected When Your Cell Phone Pulls You Away” as part of the College of Arts and Sciences’ Main Street speaker series. In the following Q&A, Miller-Ott talks about her study examining phone usage between helicopter parents and college students, the weird impasse we find ourselves in when a companion is on their phone, and how texting can lead to miscommunication, especially between couples and friends. The interview has been edited for brevity and clarity. Do you have strong opinions about cellphones? It’s interesting being in the academic environment now and seeing students with phones. And I think, “That’s too bad. 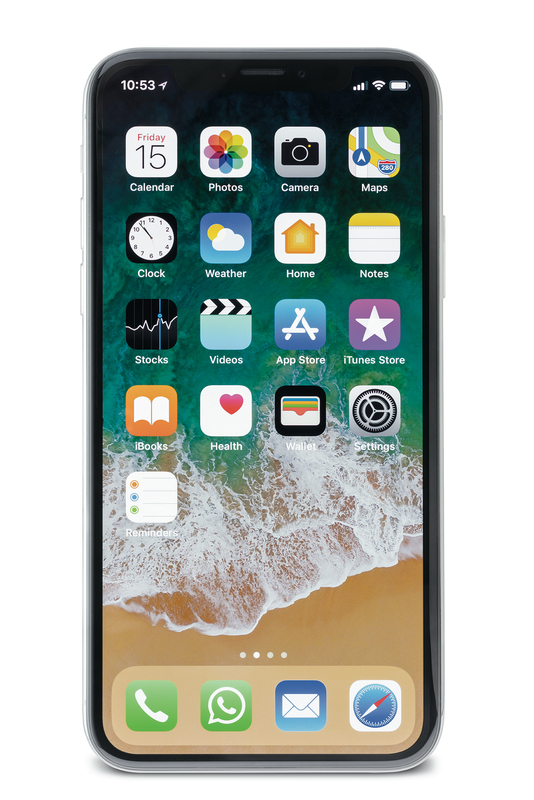 I’m sorry that you have those because life’s different when you’re not attached to your phone all the time.” I certainly don’t hate cellphones; a lot of the time my students think I hate them because I have very specific policies in my class about not using them. This whole checking the phone under your desk while I’m talking—as a professor, I find it incredibly rude. And it’s not just the students. It happens at meetings all the time. Parents and professionals are just as guilty of it as the younger generations are, so I don’t hate phones. I think they’re useful in the ability to keep in touch and to check up on people and in case of emergencies. they wouldn’t be able to keep up their relationship, because they live far away from each other. So, of course, it’s wonderful, but I think it’s the day-to-day interactions that it’s most impactful on. Those opportunities that we have where we’re sitting face-to-face with somebody and we’re choosing to be disconnected by using our phones. And I wish that we could separate ourselves from our phones. And that’s one of the things that we’ve looked at a lot in our research, the desire to disconnect and if we can actually disconnect even if we wanted to. No. That’s a very common theme in a lot of my research. People will say it in interviews: “I would love to turn my phone off, but if I do, I turn my phone back on and I have my mom who’s like, ‘Are you alive? You’re not responding right away. Are you dead?’ and I’ve got my boyfriend asking, ‘Why are you not responding? Are you mad at me?’ I’ve got my boss going, ‘I needed to get in touch with you and I couldn’t. Where were you?’” So it’s very hard, if not impossible, to completely disengage from other people. You conducted a study examining helicopter parenting and cellphone usage among college students. How did you define helicopter parenting? The idea of helicopter parenting is a parent who has an excessive need for control over their child. They make decisions for their children in an unhealthy way. It’s to the point where the child becomes unable to make decisions on their own. These helicopter behaviors start at a really young age, and we see them continue into college and into the workplace, which is really scary. How often, just based on the research you looked into, regardless of whether they were helicopter parenting or not, were college students and parents communicating with each other? Once a day at least through cellphones, often much more. They communicated with moms much more than with dads. How does the cellphone contact vary between helicoptering parents and nonhelicopter parents? A lot higher for dads but not for moms. Regardless of helicoptering, children talk to moms a lot on their phones. It seems that, “I talk to my mom a lot, even if she’s not a helicopter parent, and I feel close to her and I’m happy with my relationship.” But for dads, there was a lot more contact for high helicopter dads compared with nonhelicopter dads, and the students seemed to like him more. They felt closer and more satisfied with the dads who helicoptered. Do you and your fellow researchers know what an appropriate level of cellphone communication would be between parents and children? No, I think that would be so personal to the family. As far as what’s healthy, they need to work that out themselves. You did a study looking at when it was polite or impolite for college students to use cellphone when they were with friends? What is the politeness theory through which you examined this issue? Part of it has to do with face, that I have a certain impression that I want to put forth to other people. In this realm of politeness theory, I can have either positive face, which is my desire to be liked by other people, to be thought of in a positive way. And then there’s negative face, which is my desire to be autonomous, to make my own decisions, which is what helicopter parenting threatens. So according to politeness theory, certain events or activities can happen called face-threatening acts, and those things make us lose face. So we then engage in certain behaviors to try to restore our face. Also when someone is engaging in a face-threatening act, we have certain behaviors that we might do to get them to stop doing those behaviors. And those things we say to them are influenced by how much we care about their face. We’ve looked at that from a qualitative perspective and more recently through survey data to figure out, when someone is using their phone, when you’re with them, how do you feel: Is it threatening to your own face, and then what do you do about that? So, we tend to find that most threatening in general to face are activities like playing games on your phone, mindlessly scrolling through your phone. If it’s behaviors like, your boss is trying to contact you or if your mom is trying to contact you, that tends to be a little less face threatening. We also found in our most recent work, is that cellphone usage in general is not as negative face threatening, so it doesn’t really inhibit our independence but it’s more positive face threatening. It makes us feel bad about ourselves. We also found in our research where you are matters. So if we’re on a date, cellphones tend to be less acceptable. If we’re hanging out, watching TV, a casual context, we tend to be more accepting of those behaviors and cellphones tend to be less threatening to us. We have found in our research through other theories besides politeness theory that there is this tension with cellphone usage that we’ve come to experience. It’s normalized now in our society to use our phones, but we hate it at the same time. We wish we didn’t have to use it at times, but people expect us to. It doesn’t bring us closer; it makes us feel disconnected when we’re in the same physical space. If we’re at a distance, it’s great because I can text you and we can chat, but when we’re together, we don’t like it but we don’t say anything. We think that culturally it’s become so acceptable that if I tell you to get off your phone, I’m now causing you a face threat because I’m pretty much violating your negative face because I’m saying, “’Don’t do what you want to do right now,” and that’s not my place to do that. The last study I want to talk about is one focused on the miscommunication in text messages. You gathered actual text from 295 people. Did you do a survey as well? We did. It just got published. For the first part of the survey, they had to give us exact texts they thought involved miscommunication. They had to explain in their own words who started the conversation and why they think it’s miscommunication. Then they had to talk about the type of relationship they had, how long they’ve known their partner, and how close their relationship was. Is there anything else interesting about what you found in that study? The first time we submitted this article the reviewers kept saying, “We don’t think this miscommunication is unique to texting.” So then we reanalyzed the data to make an argument that our findings were specific to texting. I think that was the big takeaway from the article and why they published it. Because what is it about texting? The fact that we text on the go, text quickly, we text little snippets of information, we have typos, we’re not sitting face-to-face with that person so the person can’t be like, “What did you say?”—all those things make it unique. So miscommunication does happen face-to-face, but it’s different because you’re not able to read nonverbals. And then there are the things like, “My phone died,” or “It autocorrected my words.” Stuff like that when the emoji didn’t come through on the iPhone because I have an Android—things that wouldn’t happen face-to-face. Also realizing how much we rely on text messaging and it’s so heavily full of miscommunication, it’s like, man, we’re in trouble. And so, how do we overcome that? We didn’t explore that but just being more aware of what can happen is important. We found in our data that people were using their texts to have really big conversations about their relationships or blaming texting because of their relationship issues. What you saw as miscommunication wasn’t because of texting; it’s because your relationship was having problems and you were trying to work it out through texts. That’s a relational issue. But that’s interesting because people are somehow blaming the technology for things that aren’t technology-related. How much does the fact that large companies are creating addictive products like Facebook has to do with phones dominating our lives? I think the ease at which we are able to use these devices and what’s on them creates that need to use them so much. When we first started studying this, we didn’t have all of these apps on our phone to be able to be in contact with people all of the time. The function of that creates this need to be on your phone all of the time. There is this fear of missing out. In my Main Street talk, I reference the movie The Net from the 90s, starring Sandra Bullock. The movie was all about how she could do everything from her house. She could order pizza online, she could work from her home, she never has to leave. I remember thinking, “That is so weird.” But now that’s possible: You could not talk to anyone all day long face-to-face and still have connections, know what people are doing, be able to eat, be able to get from place to place, whatever it is, without ever having to have an interaction. When you grow up like that from an early age—when you get a phone at 6 years old—it’s not too surprising that people are buried in their phones. People now can’t have a face-to-face interaction. On campus people are walking together, and everyone’s on their phones. I think there’s a danger in that: You don’t have to talk to anyone if you don’t want to anymore because you can literally do anything on your phone, which is scary and harms our ability to have good interpersonal interactions. Professor Aimee Miller-Ott offers tips on how to avoid mobile phone conflict. Be aware of the impression you are making. Since doing this research, I’ve tried to be much more aware of what I do. You can make statements that acknowledge that you are about to use your phone, but that the person you’re talking to is important, for instance by saying, “I have to take this quick. Please excuse me. I’m listening to what you say.” You may also want to apologize. “I’m sorry; I’ve got to take this real quick.” Be very aware of the impression you are giving off and how using your phone may really make people frustrated or feel unimportant, and do what you can to repair those feelings for your relational partners. Host device-free social events and family gatherings. We hear some people talk about the importance of everyone putting their phones away when at dinner, for instance. They turn it into a ritual of everyone placing their phones in the middle of the table so they can’t access them. This ensures that all are attentive to one another. Use your phone to do activities together. In my work, relational partners who watch videos together, check social media together, or related activities tend to be more satisfied with the phone. Find ways to make the phone a joint activity. Ask a Redbird Scholar: Why are we running out of bees? Ask a Redbird Scholar: Why does human hair turn gray? Ask a Redbird Scholar: Why are bird eggs different colors?